The 55th-annual Farm Science Review will be Sept. 19-21 at the Molly Caren Agricultural Center in London. Tickets for the 2017 Farm Science Review, a three-day agricultural trade show Sept. 19-21 at the Molly Caren Agricultural Center in London are now available for purchase online at fsr.osu.edu. More than 120,000 people typically attend the Review, an event sponsored by the College of Food, Agricultural, and Environmental Sciences at The Ohio State University. Show hours are 8 a.m. to 5 p.m. Tuesday, Sept. 19 and Wednesday, Sept. 20 and 8 a.m. to 4 p.m. Thursday, Sept. 21. Now in its 55th year, the Review offers visitors some 180 educational presentations and opportunities presented by educators, specialists and faculty from OSU Extension and Purdue Extension, as well as the Ohio Agricultural Research and Development Center. Tickets for the Review are $7 online, at a OSU Extension county office or participating agribusinesses and $10 at the gate. Children 5 and under are free. OSU Extension is the outreach arm of the college and OARDC is the research arm. 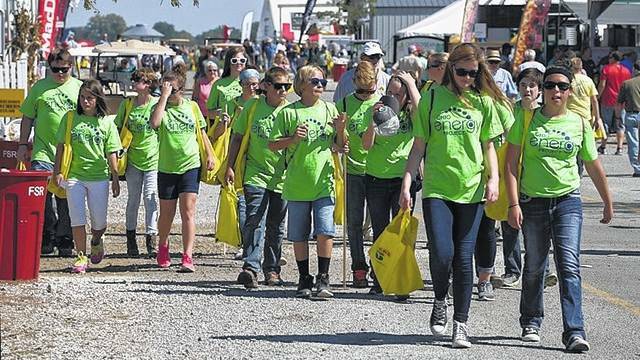 https://www.recordherald.com/wp-content/uploads/sites/27/2017/08/web1_FarmScienceReviewcrowdpiccol.jpgThe 55th-annual Farm Science Review will be Sept. 19-21 at the Molly Caren Agricultural Center in London. Alayna DeMartini can be reached by email at demartini.3@osu.edu or call 614-292-9833.